Thomas J. Mitchell, a member of Blessed Trinity parish, Breezy Point, died suddenly July 12 at work. A Mass of Christian Burial was celebrated at St. Thomas More Church, Breezy Point. 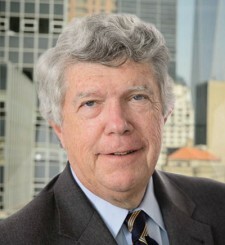 He was a partner at McCanliss and Early LLP in Manhattan. A graduate of Fordham Prep, and Fordham College and School of Law, he served in the U.S. Army as a first lieutenant in Korea during the Vietnam War. He was past Commander of the Veteran of Foreign Wars Post 8540 and an active member of the American Legion. He also served as president of Blessed Trinity Holy Name Society, lector, extraordinary minister of Holy Communion and a Knight of Equestrian Order of the Holy Sepulchre of Jerusalem. He is survived by his wife, Patricia and his children, TJ, Sean Patrick and Erin Mitchell Moran.